Sensational Anderson lights up the Grand Slam! 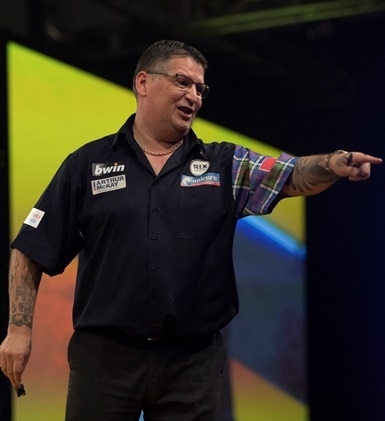 It was an amazing Gary Anderson who took centre stage in Wolverhampton on Sunday night. Gary booked his place in the knock-out stages of the Grand Slam with a breath-taking display to win the all Unicorn affair 5-1 against Ian White. Elsewhere on a dramatic second day, James Wade is also through to the last 16, Michael Smith is close to qualifying, while White, Keegan Brown, Mark McGeeney and Dimitri van den Bergh all face straight shoot-outs in their last group matches.....win and qualify, lose and go home! But Anderson was the undoubted star of the show on Sunday. His incredible average of 112.54 was the fourth highest in the history of the Grand Slam. Gary smashed in SEVEN 180s in just six legs and hit 71% on the doubles to go through with a match to spare. That is against Steve Hine.....White faces a straight knock out situation with German Michael Unterbuchner in his last group game. But it was a dazzling destruction from ‘The Flying Scotsman’. Wade made it two wins out of two and was again in superb form as he won his all Unicorn clash against Keegan Brown 5-3. Brown though is still in the mix to join Wade in the last 16. If he beats Dutchman Wesley Harms on Tuesday night, he is through. Smith withstood a barrage of power scoring from Krzysztof Ratajski to win 5-4 and top his group after back-to-back victories. His last match is against Raymond van Barneveld who must win to qualify, but barring a mathematical improbability Smith will reach round two whatever happens. And it will be Dimitri van den Bergh against Mark McGeeney in a huge all Unicorn clash for a place in the last 16 on Monday night. McGeeney kept his hopes alive with a battling display to beat Ryan Searle 5-3. Van den Bergh will be kicking himself. He blew a great opportunity to beat Rob Cross and was edged out in a last leg decider. McGeeney, who endured that nightmare on the doubles against Rob Cross, kept his composure. He was 1-3 down against Searle but reeled off four straight legs to keep his hopes alive. Van den Bergh took out a superb 106 to lead 3-2 but crucially then missed four darts to go 4-2 up. It was a big moment as Cross fought back. In a dramatic deciding leg, the Belgian missed the bull for a 122 finish to win it only for the World Champion to nail D8 last dart in hand to secure his spot in the knock-out stages.